Location appendix, tables and index are cross-referenced with photos and figures. The book is now ready in CD-ROM format. It is in PDF format, which is Windows and Macintosh compatible. It comes with simple instructions. All photos and diagrams print excellently. 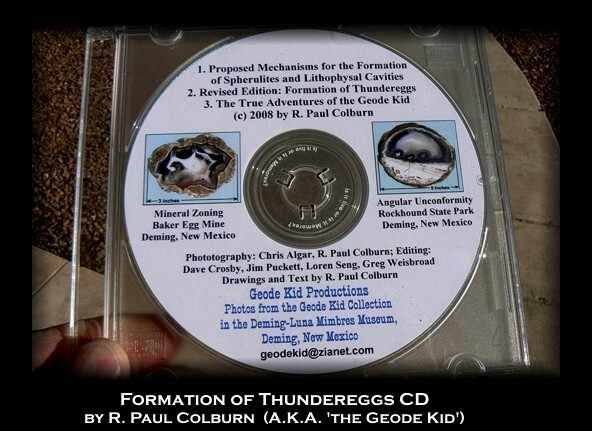 This CD-ROM format is proving to be quite popular, with hundreds of orders being filled. The full price is $47.00 which includes insured first-class postage. Send only check or money-order made out to 'Geolapidary Museum'. Our mailing address is: Geolapidary Museum, 6235 Stirrup Rd, S.E. , Deming, N.M. 88030. There are many tested methods herein, such as how to find deposits and how to cut the agates from them. There are some controversial issues I am quite sure of, and others that need the testing to prove or discard. As one ventures into unexplored areas of thought, what one day produces an idea to write down, the next may find for it an answer worthy of changing it to a statement. This is why good books have updated editions (this latest edition is current as of 2008). It is in the interest of science to approach new ideas truthfully and it is in my interest to share what I have discovered with my customers, among you, the professional geologist, the layman, the collector, the lapidary artisan, and the rockhound. See examples of photos and introduction on the next page.